The Irish government has said it is willing to cover the cost of European Health Insurance Cards (EHIC) for all citizens in NI after a no-deal Brexit. Tanaiste (Irish deputy PM) Simon Coveney said this would cost up to 4m euros (£3.46m). He said the cards would be available to everyone in Northern Ireland, not just those who hold an Irish passport. Mr Coveney was speaking during a visit to Downpatrick on Wednesday. Will Erasmus scheme continue after Brexit? Mr Coveney said this was a "contingency plan" in the event of a no-deal Brexit. "We want to try to extend those privileges to everybody in Northern Ireland," he said. "That is something we would try to progress on the basis of residency in Northern Ireland as opposed to whether you hold a British or Irish passport which, of course, is a sensitive thing linked to people's background and identity." Taoiseach Leo Varadkar previously said he wanted it to be retained post-Brexit for people in Northern Ireland. The UK is trying to reach agreements with EU governments to extend the reciprocal health care arrangements. 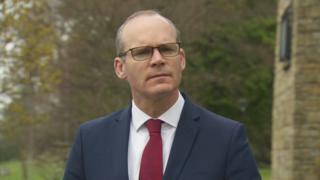 Mr Coveney said the Irish government was working to ensure it could be extended for people in Northern Ireland and added that because they would no longer be resident in the EU, it would "pose challenges". He also said it would mean having to pass legislation in the Dail. "When EU citizens travel across the EU they have health insurance cover," Mr Coveney said. "That will involve passing legislation here and it will involve the Irish government if necessary paying for that insurance cover for citizens in Northern Ireland." He added that he wanted to ensure citizens in Northern Ireland could continue to access the Erasmus programmes after Brexit. The Erasmus scheme is an EU programme that helps students study in other countries. The tanaiste said that he recognised the uncertainty about Brexit had caused concern about future arrangements, but that nothing changed the position that Irish citizens in Northern Ireland "continue to be EU citizens". Anyone born in Northern Ireland has the right to identify as Irish or British or both, thanks to the Good Friday Agreement, a peace deal signed in April 1998 by the British and Irish governments and Northern Ireland's political parties. In a statement, the Irish Department of Foreign Affairs said that "in order to fully uphold the spirit of the Good Friday Agreement, where issues arise with the UK exit from the EU, these should be addressed in a way that avoids any difference in entitlements based on citizenship in Northern Ireland". Brexit: Why are vets being recruited?